The 42nd flight of India’s Polar Satellite Launch Vehicle (PSLV-C40) carrying the 710-kg Cartosat-2 series satellite is expected to take off from the Satish Dhawan Space Centre (SDSC) SHAR, Sriharikota, at 0930 hours IST on Friday, January 12, 2018. The Cartosat-2 series satellite launch is a follow-on mission with the primary objective of providing high-resolution, scene-specific spot imagery. It carries panchromatic and multi-spectral cameras operating in time delay integration mode and is capable of delivering high-resolution data. This will be the third satellite in the Cartosat-2 series. Isro officials said that after the PSLV-C39 failure, the organisation conducted repeated tests to ensure that such problems did not occur again, which is why Isro took slightly more time for the PSLV-C40 launch. On August 31, following a perfect launch, India’s mission to put its backup navigation satellite IRNSS-1H in orbit onboard PSLV-C39 failed after a technical fault in the final leg. The officials added that the launch of three Indian satellites during the mission would mark the rollout of the 100th satellite from Isro. The 28-hour countdown activity for the mission started at 05:29 hours IST on Thursday, January 11, 2018, after the Mission Readiness Review committee and Launch Authorisation Board cleared the countdown on Wednesday. After the countdown began, the propellant filling operation of the fourth stage (PS4) of PSLV-C40 was carried out. The rocket will carry a Cartosat-2 series satellite for earth observation and 30 co-passenger satellites. Together, the 30 other satellites will weigh about 613 kg at lift-off. The co-passenger satellites comprise one microsatellite and one nanosatellite from India as well as three microsatellites and 25 nanosatellites from six countries — Canada, Finland, France, the Republic of Korea, UK, and the US. The total weight of all the 31 satellites carried onboard PSLV-C40 is about 1,323 kg. The 28 international customer satellites are being launched as part of the commercial arrangements between Antrix Corporation Limited (Antrix), a Government of India company under the Department of Space, the commercial arm of ISRO and the international customers. The co-passenger satellite comprises one microsatellite and one nanosatellite from India as well as three microsatellites and 25 nanosatellites from six countries including Canada, Finland, France, Korea, UK and USA. Primary Satellite The Cartosat-2 Series Satellite is the primary satellite being carried by PSLV-C40. This remote sensing satellite is similar to the earlier six satellites of the Cartosat-2 series and is intended to augment data services to the users. 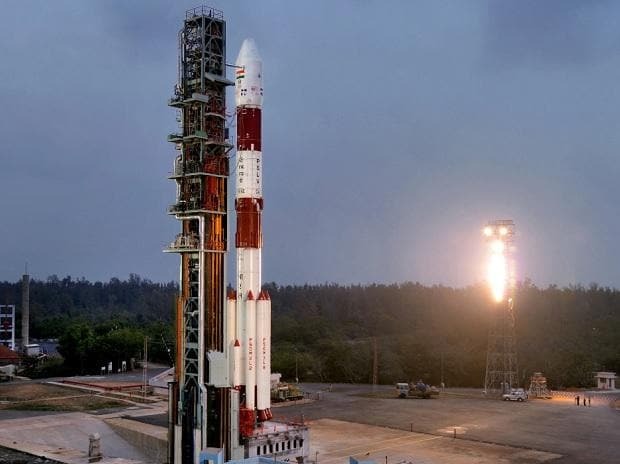 After its injection into a 505 km polar Sun Synchronous Orbit by PSLV-C40, the satellite will be brought to an operational configuration, following which it will begin providing regular remote sensing services using its Panchromatic and Multispectral cameras. The imagery sent by the satellite will be useful for cartographic applications, urban and rural applications, coastal land use and regulation, utility management like road network monitoring, water distribution, creation of land use maps, change detection to bring out geographical and manmade features and various other Land Information System (LIS) as well as Geographical Information System (GIS) applications.